First thing in the morning there is not much water in the bay. Got up pretty early this morning for no particular reason. I slept well and there was no noise, I guess I just had enough. I finished the Michael Palin book last night, shocking to think that it took me nearly three months to read On The Road and less than two weeks to read this one. It was good, I’m not sure it will last the test of time but I enjoyed. Today I started thinking I had 36 miles to do and in the end I did 48. This was a gift of goole maps for bicycles that pointed me in the direction of a short cut through the mountains that was obviously not good for a loaded turing bike. Fortunately just at the junction between the planned route and the one that I ended up taking there was a caffe and, having second breakfast there I got into conversation with other cyclists and they advised me against leaving the main road. The route I followed today was pretty and scenic but I mostly took it in rather than stopping and taking pictures. They would have been no to dissimilar to other I took before and, undoubtedly, that I will take in the future. I did however stop and took a couple of pictures of the river and the bridge at Pelorus Bridge. Apparently one of the scene of the Hobbit (second movie) was filmed around here. River, beautiful, image does not do it justice. Bridge, pathetic, only one lane. After that I hit the first hill, the lower one. It was testing but not too long and it was followed by a long flattish bit so I caught my breath and got ready for the second hill. When it came it was brutal, much longer than the first one and with bits that had a very serious gradient. All together today I climbed to just above 1200 feet which is not much in the scheme of things, but the way these climbs come about always leave me with little in the pocket when I get to the top. Today was not different and nearly at the top of the second hill, though I did not know I was nearly there, I stopped to drink and to see if I had mobile coverage. If you forgive me the small digression I’ll tell you that mobile coverage was nearly absent all day and I think this is just what is going to be like until I get to Dunedin and the east coast. Following Karen and Willy on the last few hundred yards to the summit. Finally the ukulele comes out of the bag. Back to my pause. 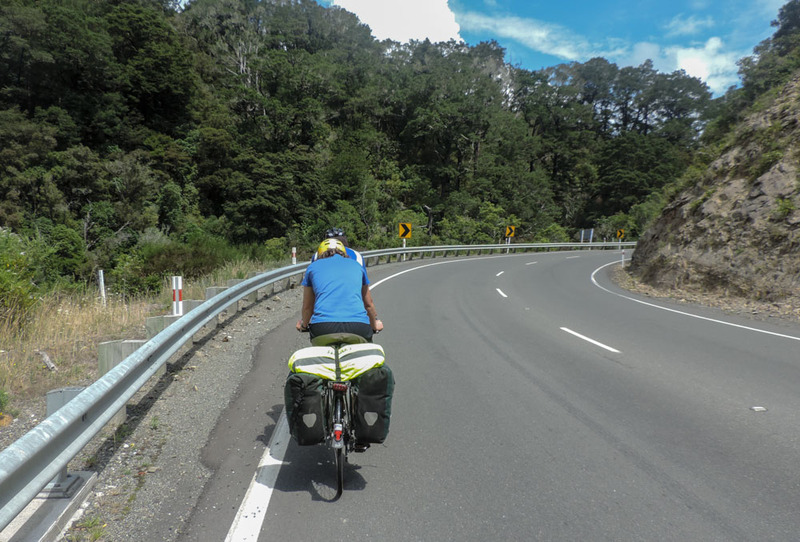 I was sitting on a guardrail at the side of the road when a couple on a tandem approached and stopped. They were Karen, on her way to Nelson for a meet-up of environmental advisers and Willy. 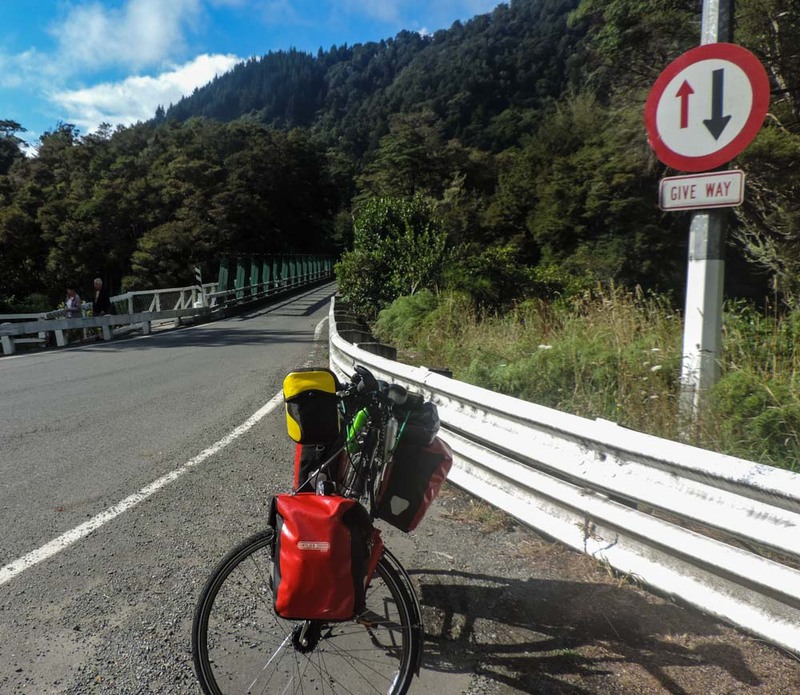 Coming from Masterton in the north island they had decided to “commute” with the bike. We had a chat while we all were regaining some strength and then we continued in the brief remaining uphill bit and in the exhilarating long and windy downhill that followed. After we made it to the coast we rode on the costal bike path for a while and then we parted company but not before I had shown them my magic ukulele which I have to start putting some hours on or I’ll end up just carrying it around the world without making any real progress in playing it. Nelson does not seem a big place and I have decided to skip visiting it, I want to make sure I’m up early tomorrow as I have to ride 70 miles before I get to a campsite. I stopped however at a fruit stall and in a dairy shop and got some fruit, which is really delicious down here and some muesli which formed the bulk of my evening meal when mixed with water and chocolate protein powder. I can almost see your faces as you read that, but you have to realise that the thing contains all you need and it packs like a dream, the envelope in which I move with regards to packing and carrying stuff can be pushed but only so far. 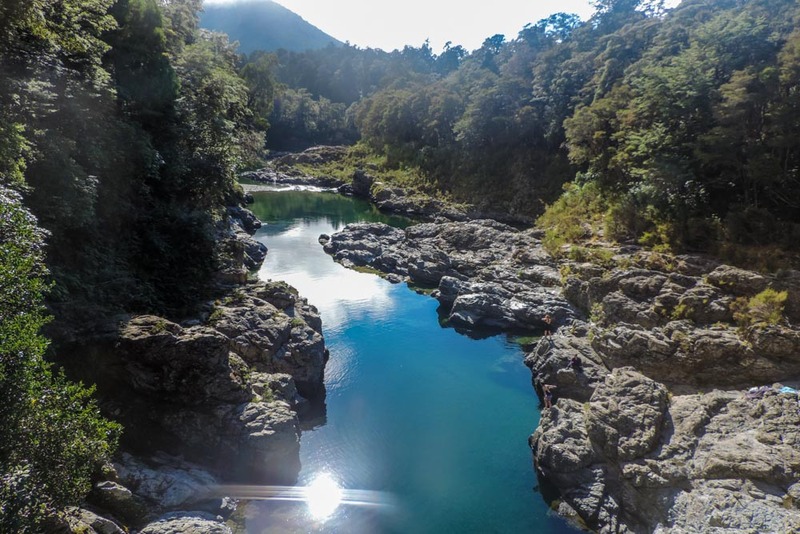 Nelson – the sunniest place on the South Island. 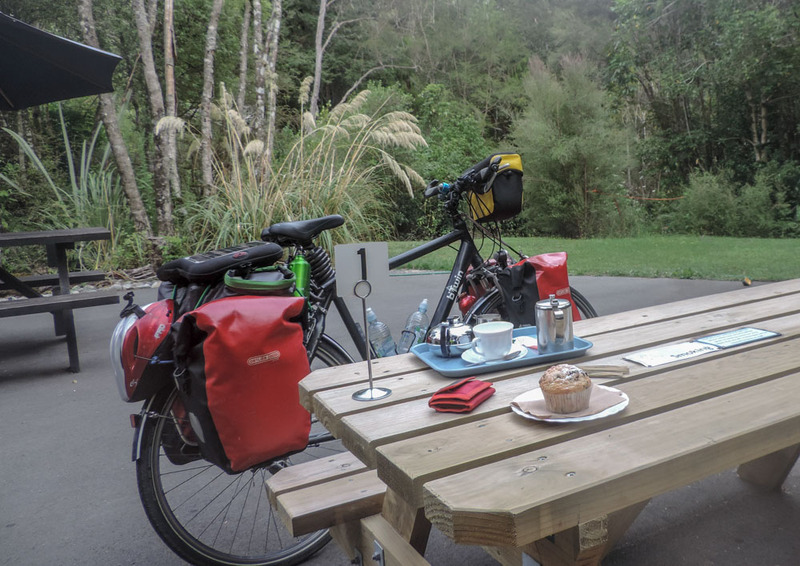 At “Perilous” Bridge is a great cafe that serves great pies…a Weka once bit Shirls foot there!!! La mia cena infrasettimanale :latte e proteine in polvere con vista sulla nuova estense mentre rientro dal lavoro! Che viaggio meraviglioso che stai facendo! !! Un bacio, a presto caro Alex.